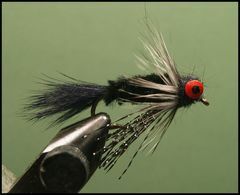 The SEM Sculpin is a great little fly that should be fished on the bottom during hot summer days. 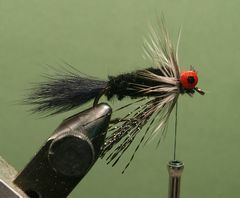 This little fly can be tied on either a size 8 or size 10 hook. The fly in the tying instructions is tied on a size 8 hook. The original pattern calls for Vernille for the body. Vernille is a dense chenille that is best know for tying the San Juan Worm. I prefer to use medium chenille for the body because, after it has been trimmed with a curved scissors, the body shape is more realistic. The heaviest lead eyes should be 1/50th oz. If you can find smaller lead barbell eyes, use them. I'm using a Whiting Grizzly Hen Cape feather for the collar because they are very soft and webby, but you could easily substitute any neck or saddle hackle as long as it is soft and webby. Fish the fly at different levels in the water column with short strips or pauses or jig it off the bottom. Attach the fly to the leader tippet with a Uni-Knot or other knot with an open loop. If you're not familar with these knots, click on "Warmwater Knots." 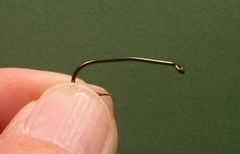 Bend the hook as shown in the photo with your pliers. 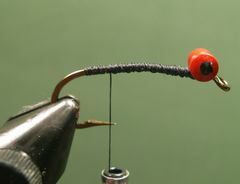 This makes the hook to ride with the point up which helps prevent snags. 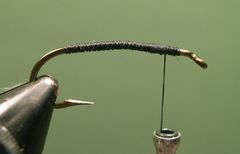 Start the tying thread behind the hook's eye and lay down a base of thread back to the hook's bend. Tie in the lead barbell eyes slightly behind the hook's eye with several figure-eight wraps of thread. Some super-glue on the thread will help lock the eyes in place. 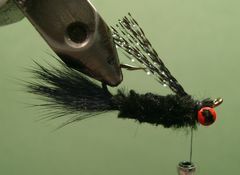 Clip a small bunch of fur from a Zonker Strip and tie it in for the tail. Tie in a piece of black chenille from the base of the barbell eyes back to the base of the tial. Move the tying thread to the lead eyes. Wrap the chenille forward to the eyes and tie it off with several tight wraps of thread. Remove any excess chenille. Trim the chenille body, on the top and the bottom, with your curved scissors. The body should taper from the eyes to the tail. This is the way the body should look after it has been trimmed. Tie in a small bunch of Krystal Flash at the base of the eyes. The flash material should extend to hook's bend. Select and prepare a webby grizzly feather to be tied in for the collar. Notice the tip that will be tied in. 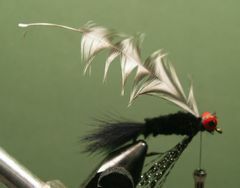 Tie in the feather at the base of the eyes with the curved side of the feather facing the hook. Take a couple turns of the feather to form the collar. Tie of the feather and remove any excess material. 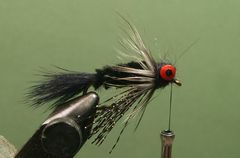 Apply a thin noodle of dubbing to the tying thread in preparation for making a dubbed head around the eyes. Make several figure-eight wraps of dubbed thread around the barbell eyes to form the head. Tie off the thread with a couple of half-hitches or a whip finish knot and your SEM Sculpin is finished.